Finally I had the time to publish my latest pattern. 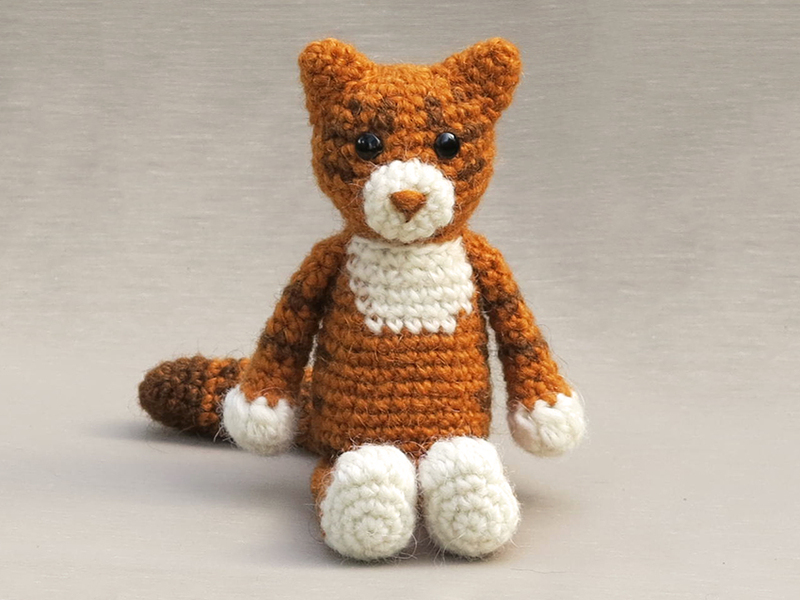 Meet Martouf, an orange tabby crochet cat! When designing this pattern, I tried to make a simple and striking, but also very versatile crochet cat. Martouf has become an orange and white tabby cat. I also thought of making him a brownish tabby or a black & white cat, there were so many options! Cats are one of my favourite pets and I love their diversity in looks. It was hard to choose which kind to make. And making my own cat, a mad black one, was not an option because that would make this pattern a bit too basic. The cat had to be multi coloured. And that diversity in looks presented another lovely challenge too. What if I could create a pattern that makes all sort of cats? So, with that in mind I started designing and for every body part of the cat, I looked if there were easy colour changes to add to the pattern, so one could make a different looking cat. This cat pattern has become so versatile, most types of cats can be made with it. For instance, in the part for the head, you can find an extra instruction of how to create a white line between the eyes. And the part for the body offers a second instruction to make a complete white belly. In the pattern you can find several of these instructions that can help you make your own cat. 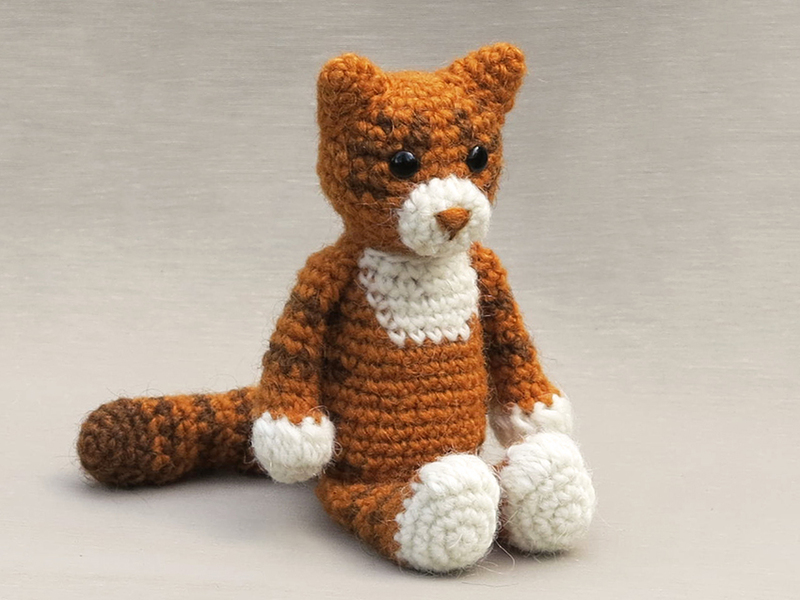 Here are some more pictures of Martouf and below it you can find info about and links to buy this crochet cat pattern. This very versatile cat is made with Istex Lett Lopi, a worsted weight wool. It is 14 cm / 5.5 inch when sitting. 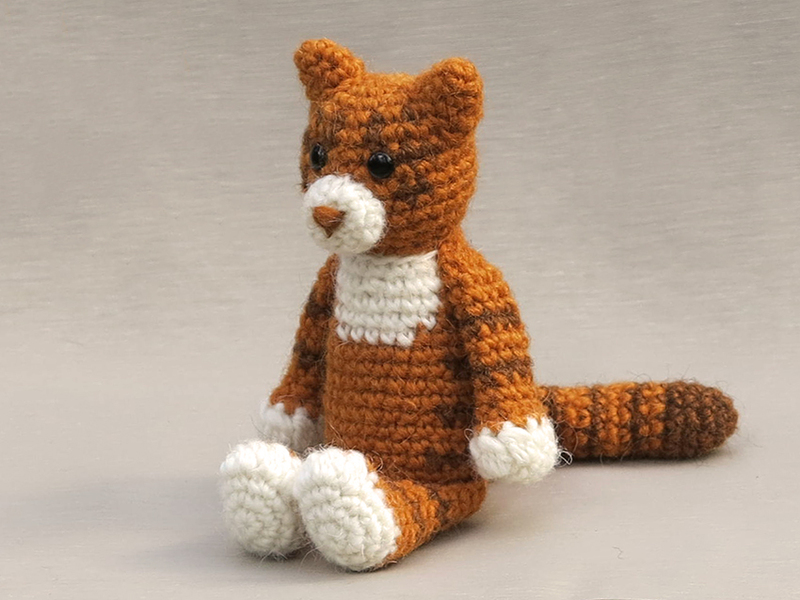 The pattern is easy to crochet and offers many suggestions and instructions to create a different looking cat. All the additional information you need to know about this pattern you can find in the shop listings. You can buy this pattern in my shop at Craftsy and in my shop at Ravelry or order it here. It contains a clear and colour coded description of how to crochet and assemble the cat, with example pictures at the bottom to help you get everything right. In the pattern you can also find what materials you need, the yarn colour numbers, in short, everything you need to know to make your own playful friend. This pattern has a one dollar release discount till Tuesday the 11th of April. The only thing better than a cat is an orange cat!! Next on the hook! What a little orange darling! I love him, Sonja! My biggest problem will be deciding how many to make! Thanks Jan & Chris, I am looking forward to seeing your projects! Such a lovely kitty! I could see myself making this in the silver tabby colours of my kitty.